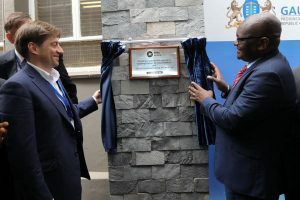 The premier of Gauteng Province, David Makhura, Transmashholding CEO, Kirill Lipa, TMH Africa CEO, Sam Bembe, and the director of MJISA investment fund, officially opened the 45,000m2 plant in Boksburg (Gauteng Province, South Africa). The facility will carry out the assembly, maintenance and modernization of rolling stock for various purposes. In October 2018, TMH, through its subsidiary TMH Africa, has completed the acquisition of the facility from DCD Rolling Stock. TMH Africa is a joint venture of TMH, which owns 70% and its black economic empowerment partner Mjisa Investments with the remaining stake of 30%. The rolling stock manufacturing facility will become Africa’s gateway production site, which will enable the assembling, maintenance and refurbishment of rolling stock. TMH Africa’s capable workforce will continue delivering innovative diesel and electric locomotives as well as coaches in South Africa and the rest of the continent.